After continually receiving the anti-union mailers this political season, I had a flashback to childhood memories. It was clearly one of the few times I remember being frightened as a kid. My Dad refused to be a ‘union man’ and crossed the picket line for work. While he was at work, someone was calling our house threatening my Mother, telling her they were coming for her and the children. My grandfather had to come and stay with us because the threats increased. Though we weren’t told the whole story, I knew some bad guys were planning on coming to our home to get us because my Dad was working in spite of the union’s demands to picket. One night I snuck down the hallway and heard my Dad telling my Mother about the union guys calling him names and throwing things at him as he crossed the line. 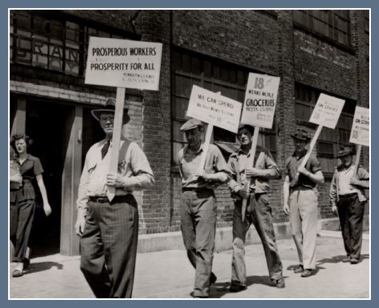 That was the way Unions operated back then. People were intimidated, hurt and told what to do. Still frightened, it was then I realized my Dad was a real hero for standing up against the ‘bad’ union guys for what he believed. It would be one of the many lessons my Dad taught me that carried me through life’s challenges. Lane Grigsby, local business owner and political activist, is spending his own money to let us know that there is a move afoot to have legislation passed that would strip employees of the ability to vote in private by unions. One of Grigsby’s mailers provides a long list of financial supporters that are union-based on Cazayoux’s political contribution list. As they say, follow the money, and you will know where someone’s heart is in a campaign. I was not happy to see that Cazayoux kept dodging political forums while both Jackson and Cassidy were willing to debate as often as possible. Cazayoux’s people claimed scheduling issues, but it doesn’t take a political consultant to tell us that when someone runs for office they clamor for public forums. Unless they have something to hide or issues they don’t want brought to light. Maybe Cazayoux doesn’t want anyone to ask him about his union bias? Either way, this gives me one more reason to not vote for Cazayoux. It was also a reason I was not a fan of Kip Holden’s candidacy as he is entrenched with the labor unions. Vote for the right-to-work and against labor-supported candidates. That means in the 6th congressional district that you would choose Jackson or Cassidy. I choose Senator Bill Cassidy to represent me. The heart of a physician, family man, and politician who turned down the legislative pay raise. That’s the kind of man I want to represent me in Washington.